For those of you who don’t know: there is now a fully-functioning Starbucks truck just outside of Mudd Library. Yes, that’s right – a Starbucks truck. You also might have noticed that the student-run startup BrewBike has just opened a new location in University Library. BrewBike was founded by Northwestern students in 2016. Since then, the company has gone from a one-bike, cold-brew-selling operation, to opening a location in Annenberg Hall, to now taking the place of Café Bergson in Main and even selling coffee in the Norris C-Store, as we recently found out. BrewBike has been so successful on campus that it has plans to expand both within Chicagoland and to other college campuses, according to its employees and SESP. So, will BrewBike be able to compete with this Starbucks truck outside of Mudd? 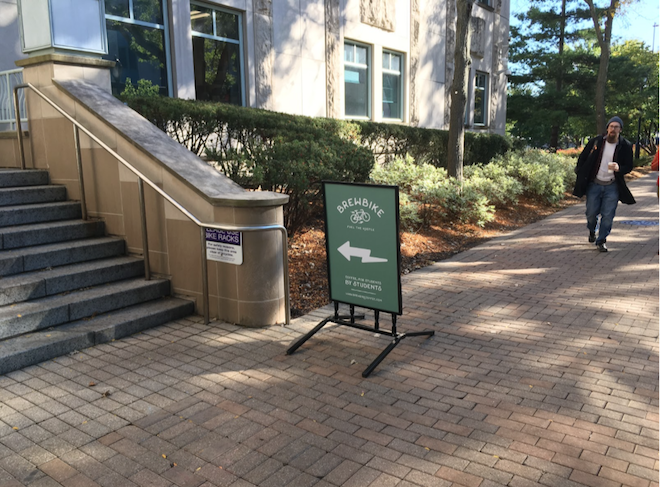 “I think [the truck] is convenient, especially for North campus, because [it’s] not like South campus where you have Norris and different options like Norbucks,” Weinberg sophomore Will Wicker said. While Wicker has not yet been to the truck, he says that he “definitely” plans on going in the future and that he has heard positive comments about it from other students. SESP and McCormick junior Helen Lu has similar feelings about the truck. Lu said that she has been to the Starbucks truck once and she liked it, but she doesn’t think that the new truck will interfere with her frequent visits to BrewBike. “I go to BrewBike a lot because I’m in SESP so I spend a lot of time in Annenberg … [I will] probably still go to BrewBike just because they’re closer to my classes,” Lu said. Despite Starbucks’ popularity, BrewBike employees do not think it will compete with their business. Del Vecchio also said that if he were to name a source of competition for BrewBike, it would most likely be Norbucks, since it’s closer to BrewBike’s locations than the Starbucks truck is. However, he said that given the new prime spot in Main, BrewBike doesn’t suspect much competition from either of the Starbucks locations. Senior Zoe Olson, a BrewBike employee of one year as well, agrees with Del Vecchio’s view that the new Starbucks truck will in all likelihood not affect BrewBike. “I feel like everyone knows Starbucks already – you know, there’s Norbucks – and so I feel like if you’re going to go to Starbucks then you’re going to go to Starbucks,” Olson said. It’s all a matter of location, according to students and BrewBike employees. With that being said, it seems that students will just go where is most convenient for them, and that there is likely not a head-to-head battle brewing (ha) between Starbucks and BrewBike. 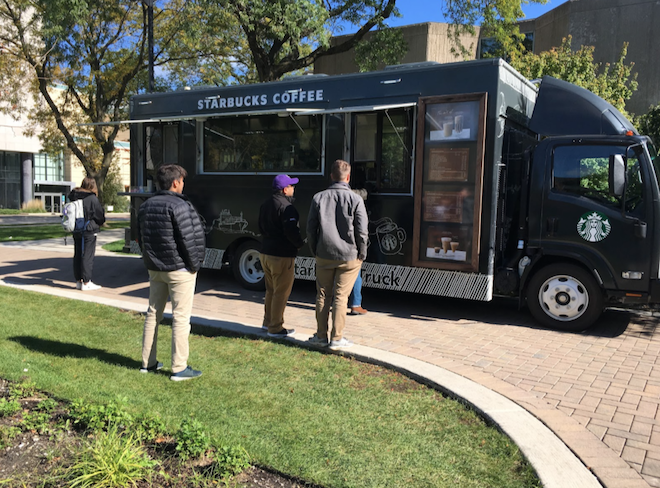 With the addition of the Starbucks truck, students in North campus are provided with a more convenient place to grab a cuppa. With the expansion of BrewBike, students in South campus have yet another place to caffeinate.